Review by Graham Stevens, Ph.D. The death of Donald Davidson last year, shortly after the publication of this book, brought to an end one of the most fruitful and influential philosophical careers of the last hundred years. Along with Quine (with whom he is most often compared), Davidson profoundly affected the direction of analytical philosophy in the second half of the twentieth-century. Although he never published a monograph, and his papers spanned a wide range of philosophical problems, Davidson's work formed a unified system that established its author as one of the driving forces in many areas, most notably, the philosophies of language, mind, and action, all of which were revolutionized by his seminal publications. 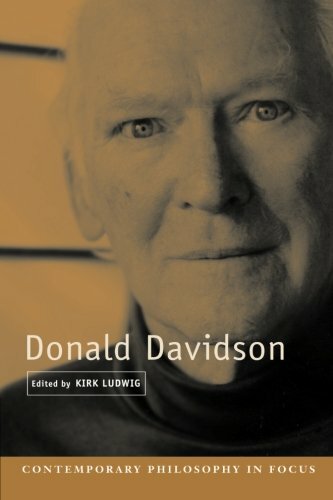 Donald Davidson is a collection of seven new papers by distinguished philosophers on each of the various aspects of Davidson's work. A particularly welcome feature of this excellent book is the effort made by the contributors to reflect the unity of Davidson's philosophy. This is not only aided by the connections made between various areas of Davidson's work in each article, but also by an excellent editor's introduction and the inclusion of papers on some of the elements which give Davidson's philosophy its unity (for example, Davidson's event ontology, detailed in Paul Pietroski's essay "Semantic and Metaphysics of Events"). The papers are more expository than critical and the result is a first rate introduction to Davidson's philosophy which will be most beneficial to students. The book is sufficiently accessible for undergraduates to digest but will also interest graduate students and those with a professional interest in Davidson's philosophy. (T) "S" is T in L if and only if S.
(T2) "Schnee ist wiess" is true in L if and only if snow is white. The fact that (T2) is genuinely informative to an English speaker who does not speak German illustrates that the apparent circularity of (T1) is illusory. Specifying the terms and their assignments is, of course, to be taken care of by the axioms used. Davidson's claim is that a complete theory of meaning for L will coincide, in all relevant ways, with a theory of truth for L. Lepore and Ludwig present the details of this technical thesis with impressive clarity. The problems for a Davidsonian theory of meaning, and the objections that have been raised against it, are explained alongside the rejoinders to them. The informative nature of (T2) plays an important part in Davidson's extension of his theory from the realm of the purely theoretical to the empirical. Davidson claims that a theory of the kind just sketched could be used to "radically interpret" the speech of a previously unknown language. If confronted by a community whose language was completely new to us we could ascertain what they meant by their statements if we could determine the truth-conditions of those utterances, according to Davidson. This claim, explored in Piers Rawlings' contribution to the volume ("Radical Interpretation") is clearly intended to both support and be supported by the claims made regarding truth and meaning. If a Davidsonian theory of meaning really is sufficient for the project of radical interpretation, this would surely confirm the adequacy of the theory of meaning: the theory would seem, after all, to be sufficient to allow us to understand anything said in the language under scrutiny. Rawling subjects Davidson's argument to detailed analysis, identifying the premises required and exploring the roots of the enterprise in the works of Ramsey, Tarski, and Quine, as well as pointing out the difficulties that still stand in the way of the claim. Davidson's work in the philosophies of mind and action is of at least equal importance to his philosophy of language. Alfred Mele's article on Davidson's philosophy of action and Jaegwon Kim's paper on his philosophy of mind each provide excellent accounts of Davidson's contributions in these fields and, in doing so, provide enough material to introduce the subjects to those unfamiliar with them. It is in these two areas that Davidson's event ontology is most explicitly called on. His theory of "Anomalous Monism" in the philosophy of mind seeks to draw on the insights of identity theories without abandoning an account of mental causation by holding that all mental events are physical but not all physical events are mental. This theory has been widely and vigorously discussed and the objections to the theory are explained clearly by Kim. In the philosophy of action, Davidson has instigated perhaps even more discussion by claiming that only by treating actions as events can the semantics of action sentences be explained. His further claim that reasons for actions are causes of those events has been so influential as to become the orthodox position in the field, as Mele illustrates. The other contributions to the volume examine Davidson's work in epistemology (Ernest Sosa) and even the consequences of his work for literary theory (Samuel C. Wheeler III). The field of literature on Davidson is already substantial and, as his work is posthumously collected, likely to continue growing. The quality and clarity of the papers in this volume, however, ought to guarantee it a high-ranking place in that field. Graham Stevens, Ph.D. lectures in philosophy at the University of Manchester and has also taught at the University of Southampton. He is the author of articles in the philosophies of language, logic and mathematics.